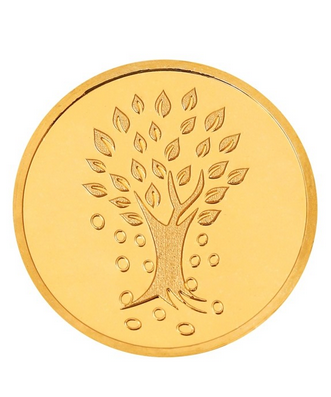 A precious coin with deep meaning and aesthetic values, the Kundan Gold Kalpataru Tree Precious Coin is named after the divine tree and celestial spirit that grants wishes, Kalpataru. A symbol of well being and blessings, the product defines the true nature of the giver and marks an auspicious beginning of the person who is at the receiving end. It’s ideal to be gifted on celebratory occasions. Made with advanced world-class Swiss technology rectangular coin is designed with rounded edges and crafted in 999.9 purity. The Kundan gold minted coin is wrapped in tamper proof packaging which is further gift-wrapped in an exclusive blue box.